A flower garden in summer is like paradise found. Check out some sizzling selections and create your own floral retreat to enjoy in the summer heat. Some flowers come and go in a few short weeks, but choose from these varieties for a season-long bloom. The flower stalks on this wonderfully fragrant herb garden favorite appear in early summer and last for four to six weeks. A second and third round of blooming follows the first, which you can help by dead-heading, the practice of trimming off the spent flowers. 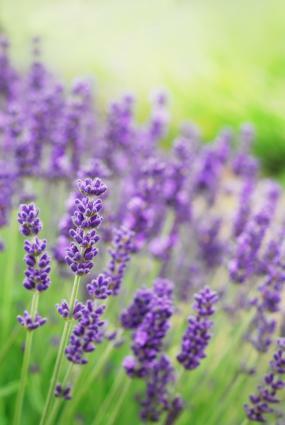 Hailing from dry rocky Mediterranean hillsides, lavender likes full sun and little to no supplemental water or fertilizer, making it one of the easiest summer perennial flowers to grow. Also known as sages, there are scores of these hummingbird-attracting flowers to choose from, many of which bloom repeatedly throughout the summer months. Mexican bush sage - This is a 4 foot by 4 foot sun-loving perennial with purple spires that is almost indestructible, which survives gracefully in drought and poor soil. Cleveland's sage - Growing 2 to 3 feet tall and 4 to 6 feet wide, this sprawling perennial has whorls of purplish white flowers that appear again and again on its wispy stems, along with richly fragrant foliage. 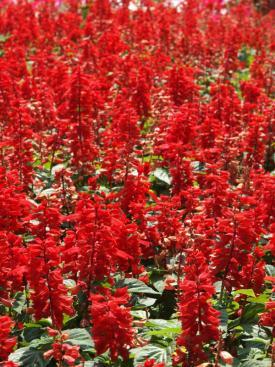 Red annual salvia - This is a small bedding annual plant with crimson red blooms that typically grows about 12 inches tall; cut off the flower stalks as they fade and it will bloom over and over as long as the weather is hot. Another carefree summer flower for full sun, asters are shaped like a sunburst and typically purple, though they can also be found in pink or white. Butterflies flock to aster, so you'll also get to enjoy their beauty as well if you plant this tough but gorgeous perennial. It's not hard to find gardens exploding with color in June and July, but so often they look drab come August and September. Add a few these species to your summer selection to end the season with a bang. 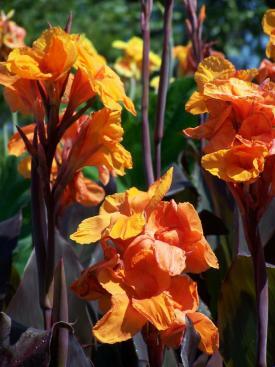 These are very tropical-looking perennial plants with 1 to 2 foot long thick, glossy leaves and flowers that come in almost every color of the rainbow. The stalks grow from tuberous roots each spring and take all summer long to reach their full height of anywhere from 4 to 6 feet before blooming. Mums, as they're so affectionately called, take a while to get to the flowering stage, but they put on a bold display once it arrives. This usually occurs in August or September and lasts well into fall. Mums are compact, low-growing perennials that become completely covered in button-like flowers and are available in an astonishing array of colors. 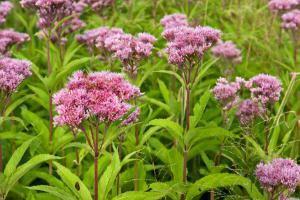 A native of eastern North America, Joe Pye Weed is another very tall flowering perennial - with stalks up to 9 feet! - that takes all summer to reach its glory. When it does, the tips of the plant erupt in dinner plate-sized domes of purple flowers for the butterflies to feast on until cool weather comes. Floral perfume takes the atmosphere of a flower garden to a whole other level. Take a look at the following fragrant flowers and consider which ones would be a good fit for your summer garden. 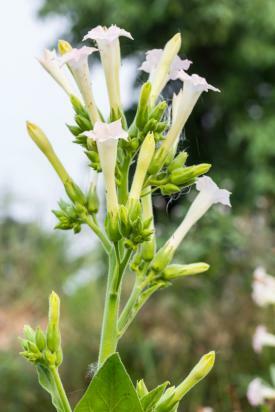 An annual species that is best enjoyed on a moonlit summer's eve, nicotiana is a tall, rambling plant that is covered in 3-inch white or yellow flowers, with a thin tubular shape that are a fountain of nectar for hummingbirds by day. Blooming in mid- to late summer, these oriental perennial lilies have knock your socks off perfume and make a long-lasting cut flower, as well. There are numerous white, yellow, pink and spotted varieties to choose from, but be be sure to pamper them with the best soil, perfect drainage and ample moisture, as they can be quite finicky to grow. There are various shrubby daturas, but the annual variety is incredibly easy to grow in the heat of summer. Also called angel's trumpet, the flowers are long, tubular and extremely showy, resembling some sort of ornate 17th century instrument. They are typically pure white and are most fragrant at night. Summer flowers are associated with sunny borders, but there are a surprising number that are right at home in the shade - quite a blessing if that's all you have to work with. 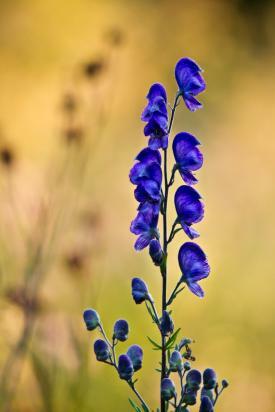 Also called aconite, this tall, slender perennial blooms in late summer with flowers of the deepest purple. Keep in mind that all parts are poisonous, so it is not the best choice for gardens where pets or small children are present. Monkshood likes deep rich soil, dappled sunlight and regular moisture. Fuchsia are classic warm weather shade plants, grown as perennials in warm climates and annuals elsewhere. The flowers dangle upside down and look like an intricate costume from some far away land. Their drooping habit makes them a good candidate for hanging baskets, but they can also be staked up to grow in the ground. There are hundreds of begonia varieties, but the one thing they have in common is a tolerance for shady conditions. Though many are perennial plants, in practice most are grown as annuals. Use them as bedding plants, in hanging baskets or as colorful accents in a shady perennial border. Flower color is all over the map, so you'll have no trouble finding something that fits with your color scheme and many varieties also have colored foliage, making them stand out even more in the shade garden. 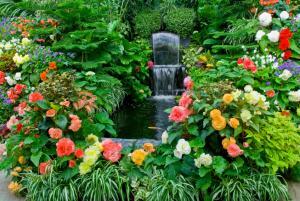 While summer is a season of boldly-colored flowers, keep in mind that spring is the best time to plant them. Let them get their roots established while the weather is cool and they will reward you in summer with robust growth and a fireworks display of color.